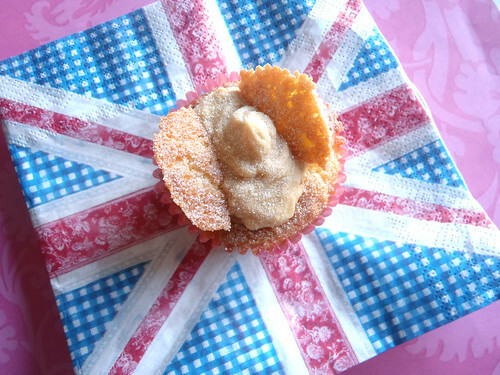 A right royal treat: butterfly cakes! In case you haven’t noticed, around here I’m still gearing up for an epic Royal Wedding Watching Party, which will have an afternoon tea theme. I’m trying to assemble a crack team of really British-themed dishes to go with it, and when it comes to afternoon tea and delicious sweet treats, you can’t get much more nostaglia from your calories than with a butterfly cake. Butterfly cakes have been sadly neglected in recent years for their more ostentatious American cousin, the cupcake. Alas, I am guilty of this as well – you only have to check out the cupcakes section of this blog to see some towering, buttercream topped monstrosities. But here’s the funny thing about me and cupcakes – I love to make them, but I’m not so crazy about eating them. Here’s a frightening confession. I don’t actually really like buttercream all that much. You forgive me, right? I hope so. But, after all that, some of you are probably thinking – ‘hey, you idiot, fairy cakes are filled with buttercream! That’s the point!’ To you, I say ‘ah hah, I already thought of that.’ So, stay tuned for something that’s going to curl your hair – my recipe for sweet vanilla cream and dulce de leche butterfly cakes, fit for serving at your very own royal wedding watching party! I’m in Cake Stand Heaven!